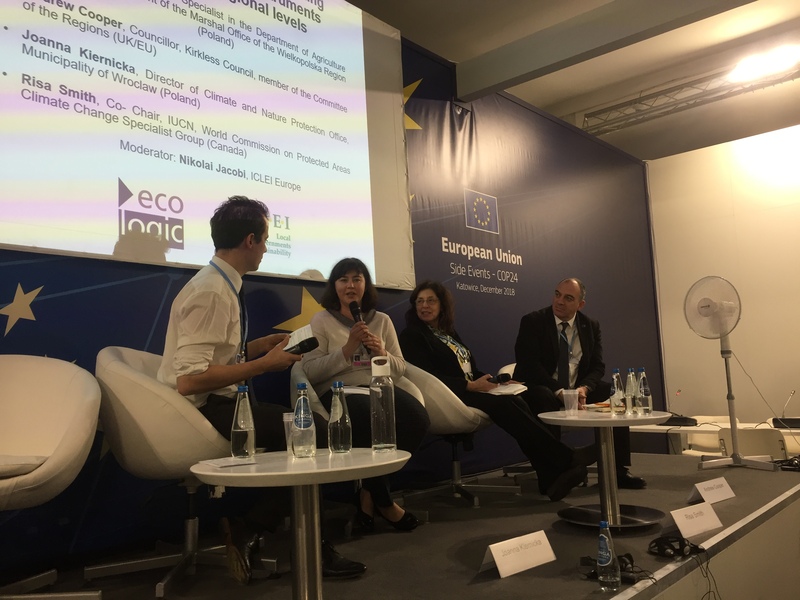 On Saturday, 8 December 2018, Ecologic Institute hosted a side event in the EU Pavilion at the COP24 in Katowice (Poland), in cooperation with ICLEI Europe. 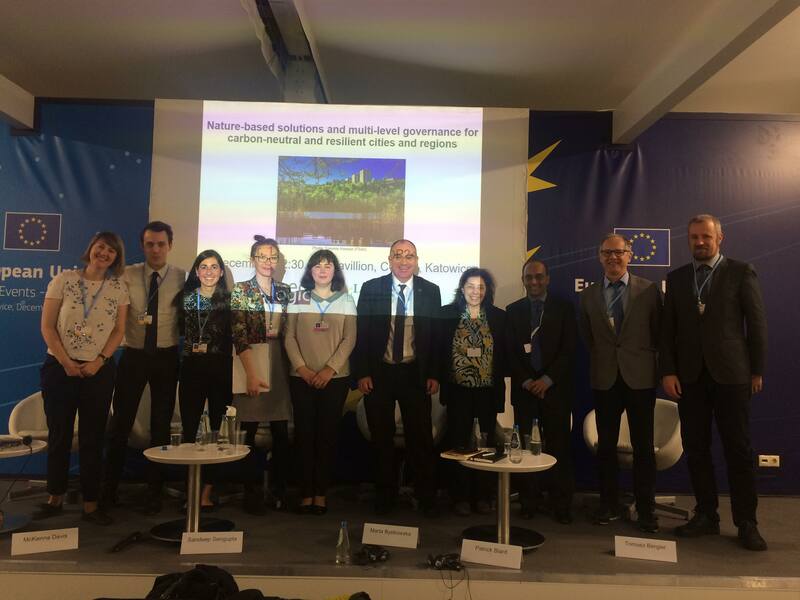 Invited practitioners and experts discussed the role nature-based solutions (NBS) and multi-level governance play in facilitating the transition of cities and regions to carbon-neutrality. In a keynote speech, McKenna Davis, Fellow at the Ecologic Institute, presented results of NATURVATION, a Horizon 2020 research and innovation project. She focused on the role of NBS as a tool to support climate targets, NBS support within current policy frameworks and potential for improving NBS uptake and governance. The presentation included insights from report "Nature-based Solutions in European and National Policy Frameworks" and the Urban Nature Atlas. The keynote was followed by interactive discussion sessions. Local and regional government representatives from Poland, UK and Canada shared their current experiences in implementing climate-proofing policy instruments at local and regional level in a lively interview session. 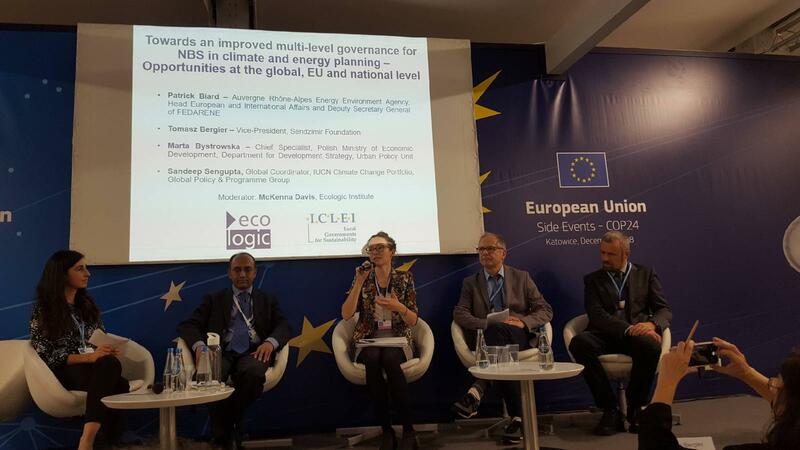 The subsequent panel discussion provided invited experts a forum to discuss opportunities to promote improved multi-level governance for nature-based solutions in climate and energy planning at global, EU and national level. Panelists provided insights into the importance of innovative multi-level governance approaches and the power of multi-level dialogue, emphasizing the role of global and national governance levels as enablers of local-level action. 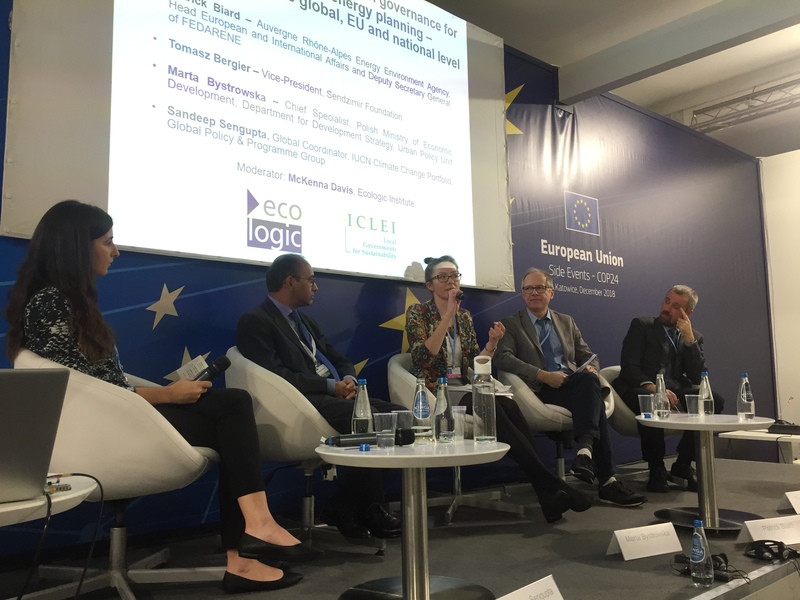 The debate stressed the importance of overcoming the silo thinking, indicating that NBS can be used to jointly achieve climate, biodiversity and societal goals – as such providing the link between Paris Agreement, Aichi Targets and Rio Conventions. It was indicated that NDCs – Nationally Determined Contributions (complemented by LDCs – Locally Determined Contributions) can provide an opportunity to integrate NBS into the climate and energy discourse and motivate national and local action. The discussion highlighted the need for collaborative partnerships of local actors and learning and exchange opportunities. The panelists shed light on the potential to promote local-level climate action by engaging citizens in implementing inspiring, non-punitive activities, such as co-production of NBS. Finally, the need to integrate NBS into regulatory frameworks and strategies to support increased implementation was underlined. 1. 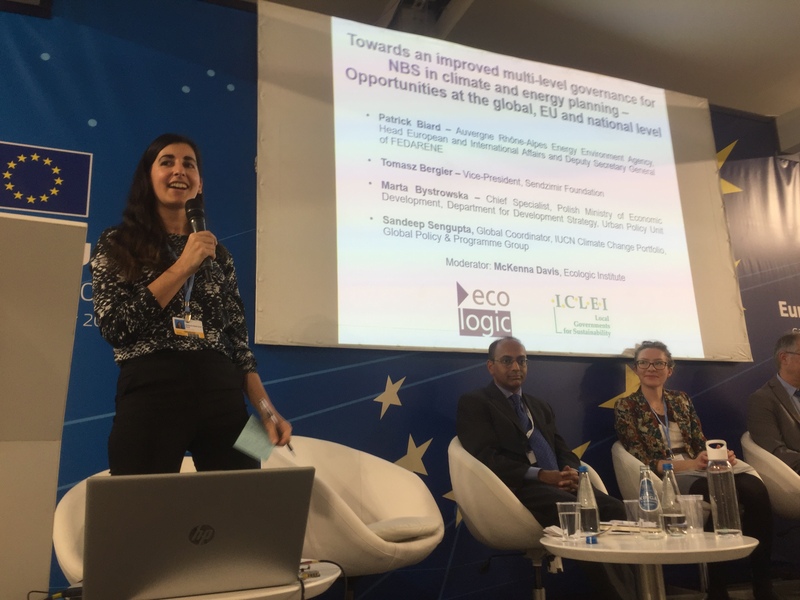 Setting the Scene: Improving multi-level governance for climate action through implementing nature-based solutions at national and EU level. 2. Interview session on stage: Current experiences in implementing climate-proofing policy instruments at local and regional level. Interviews with government representatives. Risa Smith, Co- Chair, IUCN, World Commission on Protected Areas Climate Change Specialist Group, British Colombia (Canada). 3. Panel discussion: Towards an improved multi-level governance for nature-based solutions in climate and energy planning - Opportunities at global, EU and national level. For further Information, do not hesitate to contact Ewa Iwaszuk.